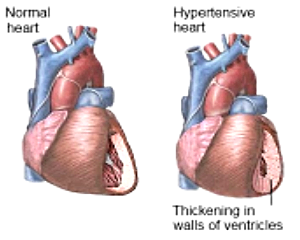 The heart is a muscle that pumps oxygen filled blood to all parts of the body. In healthy adults the heart is usually about the size of a closed fist and pumps approximately 1900 gallons of blood every day through the circulatory systems. When your heart beats, it pumps blood round your body to give the energy and oxygen it needs. Deoxygenated blood and body waste products will also return to the heart. As the blood moves it pushes against the sides of the blood vessels. The strength of this pushing is your blood pressure. If your blood pressure is too high, it puts extra strain on your arteries (and your heart). What is normal blood pressure reading? Blood pressure readings are measured in millimeters of mercury (mmHg) and usually given as two numbers. The top number is the systolic pressure and the bottom – the diastolic pressure. Normal Blood Pressure reading ideally should be at the rate of 120/80mmHg (as recommended in the USA) or 130/80mmHg (as recommended by the European Society of Hypertension) and below. What is low blood pressure or hypotension then? It is when the person’s blood pressure drops drastically below 90/60mmHg. If a person has a constant pressure of around 90/60mmHg without feeling any symptoms like headaches or vomiting, it may be that that is his or her normal Blood Pressure. Generally a person who has a blood pressure reading of 140/90mmHg and above is considered to be suffering from hypertension. High blood pressure eventually leads to enlargement of the main pumping chamber of the heart, which is measured by the “left ventricular mass index” or LVMI. For most people, there may be no single cause for their high blood pressure. We do not know exactly what causes high blood pressure. We do know that your lifestyle can affect your risk of developing it. Pre-hypertension is when your systolic blood pressure is between 120 and 139 or your diastolic blood pressure is between 80 and 89 on multiple readings. If you have pre-hypertension, you are more likely to develop high blood pressure. If you have heart or kidney problems, or if you had a stroke, your doctor may want your blood pressure to be even lower than that of people who do not have these conditions. White-coat Syndrome is a situation where some patients who normally do not have hypertension experience a temporary increase in blood pressure while they are in their doctor’s office. Previously, white-coat hypertension was considered to be harmless in most people, but some recent studies suggest that it actually increases the risk of microvascular complications in patients with type 2 diabetes.